The 1935 tickey is one of those odd coins that has managed to slip by without any notice as to just how scarce they are in mint state. I would say its scarcity in top grade is second only to the infamous 1931 tickey, though I'm not sure if 1925 could be a contender for that spot. You never read about this, you only discover it for yourself while collecting and that is how I came to be aware of its rarity. Upon explaining to another collector that I was trying to put together a 1935 set, he sharply responded "good luck trying to get a tickey in unc"
Ever boastful about what I thought I knew I replied "but 1935 3d has a high mintage, it's not a key date". But his words ring true, these coins are near impossible to get in uncirculated condition. So many graded only make it to AU, just a hair short of MS grading. I was told one theory that because these coins were so common, they were overlooked by collectors over the decades and never held back for posterity, thus most of them found their way to circulation. Today I see we are not only treated to a 1935 tickey in MS, but apparently the finest grade one at that. A seller has put up a listing for MS66 and I must admit, it looks pretty! When you look at the numbers in MS they all fall the 20 to 30 mark. I wonder if these don't all come from collector sets or mint packs? I mean take that MS 66 tickey that was listed, I don't see how such a high grade coin could have come out of circulation. For the Republic, the first non-proof sets were only issued in 1967. After the 1931, the scarcest tickey in any better grade is easily the 1925 wreath reverse. It's what I would describe as a "key" date by US standards which is why I include din my recent summary of the TPG populations. As for the 1935, I don't see that it is particularly scarce versus other KGV silver. Practically all of these coins are at least somewhat scarce in any better grade, especially when compared to comparable period coinage from developed countries. I haven't looked at the population reports in a while but Pierre's data makes it evident to me that the reason for the low numbers isn't the actual or even relative scarcity but the prices. Tickeys are worth less than most other denomination for the same general scarcity. So it is less economical to submit it for grading. The other thing I will add (yet again) is that I still don't see why South African collectors make such a big deal about any MS grade or the number of survivors graded MS-60 or better. I mean, it isn't like there is a any substantial or even noticeable difference between many of these coins and those in better AU (55 or 58) grades. Many MS-61 and MS-62 coins don't look that nice anyway. Lastly, I am not singling you out but as stated many times, our (mine, yours or anyone else's) personal experience is generally not representative of availability, whether in a particular grade, "high quality" or otherwise. If it is, then it just means that the coin is very common but not finding a coin doesn't provide any actual indication of a coin's scarcity. There is one particular contributor on the NGC Message Boards with whom I have had numerous debates who has attempted to use personal experience as "evidence" for the scarcity of the coins he likes. His rationale is he couldn't find the coins and the collectors he knows couldn't either, so therefore the coin must be "rare" or "scarce". South African coinage (and Union KGV) is legitimately at least somewhat scarce, but as I explained in my other recent posts, there still isn't any reason to believe that the TPG populations are mostly complete for MOST of this coinage. Readers of this forum just want to believe otherwise, primarily because of the potential implications on the price level. 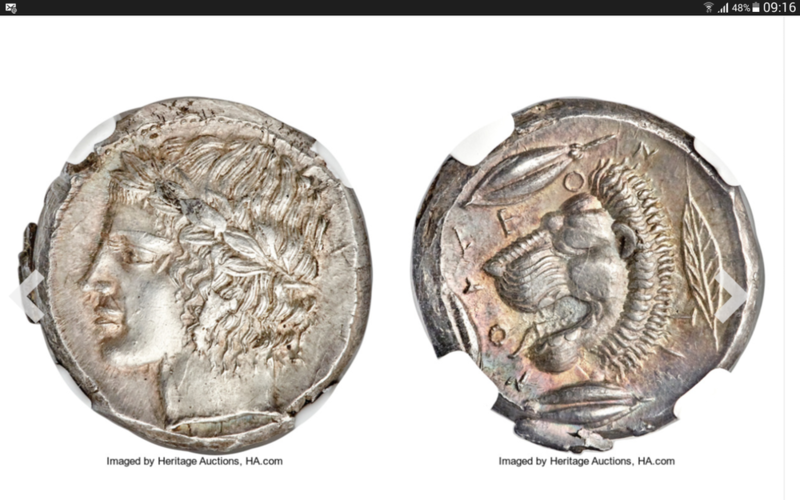 You should look at the Heritage archives for US and European coinage and the TPG population reports. In absolute numbers, there are a large number of coins graded MS-66 or better that are much older. Some of it is "gradeflation" and loose grading standards but regardless of the slab label, there are a lot of old high quality coins out there. I own a 1729 Spain NGC MS-66 SJ (Seville Mint) real. It was probably dipped at some point in the past but still a really nice coin. I paid $200 for it back in 2004. In the last year, US Dealer Atlas Numismatics sold a Byzantine silver graded Choice MS 5/5 (strike quality) 5/5 (surface quality) with a star for "eye appeal". A 1935 tickey surviving in MS-66 compared to these coins doesn't sound so out ordinary now, does it? Sorry people I know this is of subject but I could not resist, talk about old ms coins, take a look at this beauty currently on auction. The coin above is really hard to beat.